Mark Peel of Campanile and Audrey Saunders of Pegu NYC have teamed up to crash straight into the post-speakeasy era, and they’re dragging us with them. We’ve landed in the 40’s – after Prohibition, of course – and the beautiful Art Deco interior of The Tar Pit is our proof. 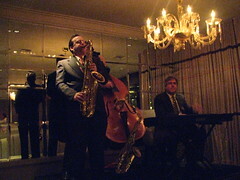 Elegance and class ooze from the cushion of each booth lined up along the wall while live jazz gives the ambiance a cozy touch. Old American classics line the bar and dining menu while Saunders’ specially-created cocktail menu lands its place as the freshest compilation in town (for now). Probably the nicest breath of fresh air is the price point being $11 per cocktail – reinforcing the notion that you don’t have to bleed at the nose for a solid cocktail…and that you should stop paying $16 for a ordering the Grey Goose-Red Bull. Once I absorbed my surroundings, I was relieved I’d worn a dress. Indeed, I wondered if the death of the speakeasy meant the birth of the unspoken, ante’d upÂ dress code in LA. Who are we kidding these days? I took my mother, hailing from the midwest, to see Joseph and the Technicolor Dream Coat at The Pantages and she was shocked to see people wearing jeans to the theatre. Another indication The Tar Pit aims to evolve the scene is the surprising lack of whiskey drinks on the menu – quite a departure from the other well-known mixology bars in town. You’ll find plenty of gin, however, with a dash of rum, tequila and vodka. Samples of most of their original cocktails were being passed around in coupe glasses on media night, which were perfect for sampling a little bit of everything (even sharing with fellow bloggers) while not getting absolutely trashed in the process. Of the ones I did get to try, Cucumber-mint creole – made with gin, aquavit, sherry, muddled cucumbers & mint, fresh lemon juice – was a good, refreshing mainstay to have on the menu. The Gin gin mule, their classic gin and ginger beer cocktail, is seasoned with mint and garnished with a slice of lime and candied ginger – the latter of which is a wild card with me, actually. Tied for my favorite cocktails, one of which actually wasn’t served en masse this particular night, were the Palm frond (lemon myrtle-infused gin, green chartreuse, muddled mint and simple syrup) and Jamaican firefly (dark rum, housemade ginger beer, fresh lime juice, simple syrup). The Palm frond comes with a reed of lemon grace through which you can enjoy your cocktail. Since I like darker spirits, I guess I preferred the Jamaican firefly just barely over the Gin gin mule – or more accurately, prefer dark rum with my ginger beer over gin. Just a warning, however – I really did not like the Trident – which mixed aquavit, Fino sherry, Cynar aperitif, peach & orange bitters and lemon essence. It just tasted a little bit too much like medicine – a unanimous vote by all bloggers at our table. 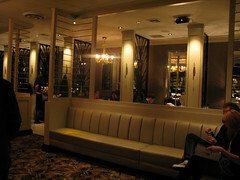 As for the appetizers, I was thoroughly surprised – of the onesÂ I got toÂ try -Â by how well done they all were. 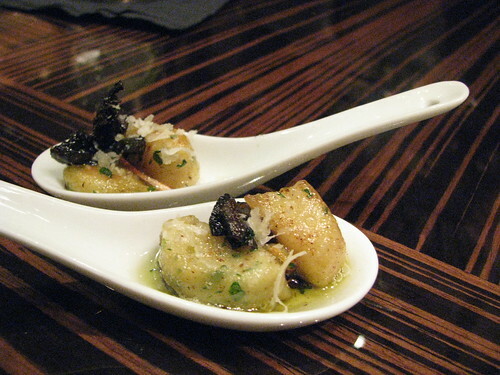 I loved the buttery potato gnocchi topped with tiny escargot on a spoon (the key word here is “butter”). The crab cakes came with a good, solid consistency on the inside – no shirking here. Now I may be a midwest girl at heart so I love deviled eggs in general, but The Tar Pit’s pickled version really hit the spot. A good sour selection on a menu to contrast the fried seafoods. Even though Caroline didn’t, I really enjoyed the fried artichoke, or Artichokes trastevere topped with cynar ailoi and deep-fried lemon. 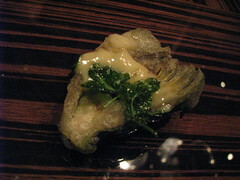 I had never had artichokes prepared this way before, but thought the delicate way in which they turned out was perfect! The aioli also gave it a good kick. They also had fried oysters at the preview, but you’ll have to read another blogger’s write-up about that since I was No. 5 matched to a tray of 4 oysters. Can I just talk about the bathrooms for a minute, here? When scoping out a new place – especially when brand new to everyone else besides me – I’m always going to take note of the bathrooms. That is, or take note to not take note of them. But the bathrooms are absolutely beautiful with crown moldings to spare and especially private stalls – you’d never have guessed that the logo of the bar is a mammoth stuck in tar (very artfully drawn, by the way). Class exudes from each corner of the place. And with the reasonably priced menus and tasty bites to match the delicious cocktails, I can see this place packing out in the very near future – that is, if it isn’t, already! Update (12/24/09): I went back to The Tar Pit last night to catch up with an old friend. The menu had changed to $12 per cocktail instead of the $11 price point in the story. I don’t think this is too big of a deal – the place was packed in for a Wednesday night (granted – not long after its opening) and the cocktails are indeed labor intensive as with the other mixology bars. 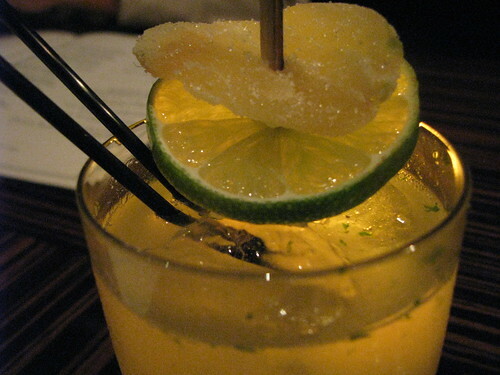 This entry was posted in cocktails, Mid-City West and tagged Audrey Saunders, bar, cocktails, la brea, La Brea Ave, los angeles, Mark Peel, Mid-city, Tar Pit, Tar Pit Bar, The Tar Pit. Bookmark the permalink.